Until the 1850s, Villerville was a small fishing village just west of Honfleur, depending on the harvesting of mussels; it then acquired a casino, theatre, and railway line, gradually becoming a fashionable holiday resort; a miniature Deauville. 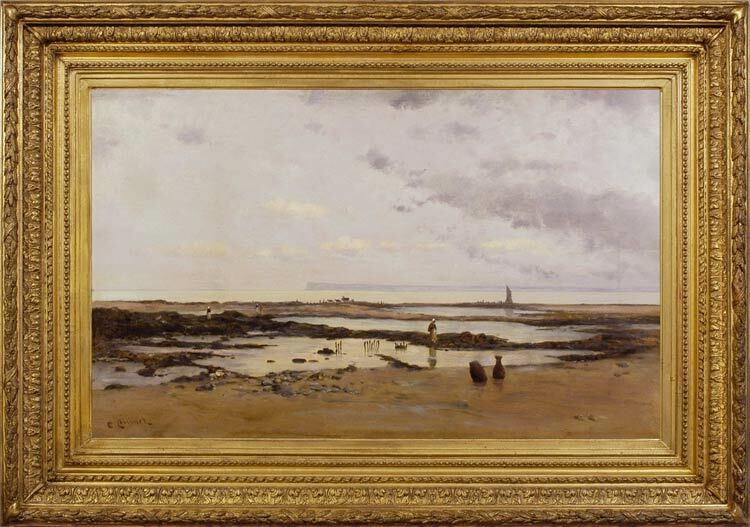 Artistes such as Daubigny, Ulysse Butin and Charles-Louis Mozin visited it, and it was said that there was no Paris Salon without a painting of Villerville’s mussel-gathering trade. Quinet’s depiction of it shows the humps of mussel beds exposed by the low tide, and the mussel-pickers, dressed in white caps and enveloping aprons, with their horse-drawn cart silhouetted against the light-filled estuary. A tranquil panorama of coastal pools under the wide early morning sky, his painting describes the changeless life of sea and beach without sentimentalizing it; like Turner, he shows the human inhabitants as small, transient beings, dwarfed by the vast forces of Nature through which they move. His picture is a harmony of light and reflected light, created through a complex pattern of warm and cool tones. Charles-Henri Quinet was born in Paris in 1830. He was a pupil of Émile Lambinet (1815-77), a landscape painter who had himself been taught by Vernet and Corot (and was mentioned approvingly in one of Van Gogh’s letters). Quinet first exhibited at the Salon in 1865 (as did Monet), with a scene entitled Les bords de l’Yère à Brunois; he went on to show his work at the Sociétaire des Artistes Français, which took over from the official Salon, from 1888. Just as Lambinet was the recorder of scenes local to his home in Versailles and Bougival, so Quinet specialized in paintings of the countryside around Paris: for instance, Personnages des environs de Paris, c.1882 (Delvaux Auction, Paris, 5 July 2000).